Originally made for photojournalists, LowePro Stealth Reporter 500 AW camera bag has features every photographer will love. 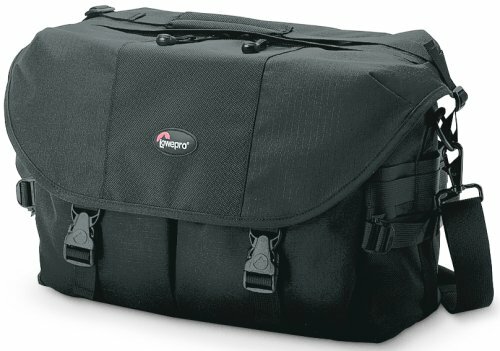 LowePro Stealth Reporter 500 AW Camera Bag includes a waistbelt slot for a separately purchased LowePro S&F Deluxe Waistbelt to help take weight off your shoulders. LowePro Stealth Reporter 500 AW provides quick access through a unique top zipper, removable padded inserts, an exclusive LowePro All Weather Cover™ for total protection from the elements. Stealth Reporter 500 AW also features a LowePro All Weather Hood for weather protection and fast gear access. You can customize LowePro Stealth Reporter 500 AW interior to suit your system, and there are lots of pockets for small accessories. Capacity: 2 pro SLRs, 5–6 lenses (up to 80–200mm f/2.8), pro flash, accessories, film. Size (Interior): 14.25 W x 6.75D x 9.5H in. / 36 x 17 x 24 cm. Size (Exterior): 16W x 9D x 11H in. / 40.5 x 23 x 28 cm.